Welcome to Open Book - a Blog about the written and visual accounts of Jesse Acosta. 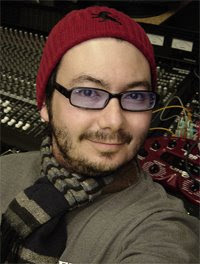 My name is Jesse Acosta and I'm an independent music producer, songwriter and amateur blogger. This web-site has been through a lot of changes since it first opened back in 2002. At first, it was used as a website to promote the first band I produced. Shortly after that I set up my music label's web site to take care of that function. After that, Jesseacosta.com was closed, then opened, the closed again. Phew! Now, I seriously hope to maintain this site open for as long as I can. Back in 2006, this website--and specially the blog part of it, was the host to my short-lived podcast called Broken English. Why did I stop producing the podcast? For different reasons, but the main one: the podcast was about nothing. I never felt comfortable doing a podcast about nothing, I always thought I could be using the podcast or this site for something with more substance; which I hope to do on this site. After the podcast ran its course, this site was closed. As a special treat, I've posted the seven original episodes on this web site. Recently, I started reading more, writing more, and recording more. That prompted me to reopen the site. Basically, this will be a repository for all things about me--sort of like a scrapbook. I plan to post my songs, writing, thoughts, and anything else I find worthwhile of being on this site. So I'm like an open book where people can read about me. Please be patient. I'm working on a biography. I've set up a chat room within the web site. I'm working on setting up a schedule where people can join the chat room and chat with me about anything.